Haringey’s new Labour-run council could miss its house building targets, damage its own finances and possibly face legal action if it ditches plans to form a property development company formulated by the previous Labour administration, according to a report to be considered by its cabinet next week. The 150-page document, compiled by Haringey housing officers, describes the potential implications for the council of abandoning the Haringey Development Vehicle, a 50:50 joint venture company the now former council leadership had been on the point of setting up with regeneration company Lendlease before it was ousted effectively before 3 May’s borough elections by a de-selection campaign supported by prominent members of the new cabinet. The report says that “the discontinuation of the HDV” could cause “a reduction in the number of new homes” or a delay in their delivery in Haringey, resulting in the borough falling short of the target set for it in Sadiq Khan’s draft New London Plan of 1,958 new dwellings a year and failing the housing delivery test recently set by the government in a revision to its National Planning Policy Framework. The report notes that “persistent under-delivery” can result in the government taking over the council’s planning powers (page 41, paragraph 6.42). It adds that abandoning the HDV “may have an impact on the Council’s ability to attract investment and/or delivery support from external partners in the future,” deterring potential alternative private sector partners and putting off financial investors “even where a direct relationship with the Council isn’t envisaged”. The report concludes that “these risks can be managed to some extent by maintaining a strong public commitment to the value and importance of investment but cannot likely be managed away entirely” (paragraph 6.44). The HDV was expected to generate 6,400 new homes in Wood Green, Tottenham and Muswell Hill, 40% of them affordable. Haringey currently has over 9,000 households on its housing waiting list. The council’s civic centre, some of its offices, its commercial properties and housing estates were earmarked for redevelopment under the plans which were forecast to generate nearly £300m for the council as well as increased long term commercial, Council Tax and business rates income following successive reductions in grant from central government. A total of £8m would have been invested by the HDV in skills and other community investment programmes, with a further £20m from Lendlease itself to pay for a new shops and open spaces and a new school serving residents of a demolished and rebuilt Northumberland Park estate (paragraphs 6.38-6.40). The report to the cabinet reproduces two recent letters from Lendlease Europe chief executive Dan Labbad, setting out the company’s position on the HDV project since the change of council leadership. The first, dated 4 July, argues that the “great deal of in built flexibility” in the HDV plan means the model could be adapted to help the new council meet its housing goals, including through a housing company which the council would wholly own (a policy the cabinet is to discuss separately (pages 187-204) and urges the council to “fully consider its options regarding the way forward”. The second letter, dated 9 July, warns that should the cabinet decide to “attempt to reverse our appointment as the successful bidder” for the HDV contract “we will have no choice but to seek to protect Lendlease’s interests, given our very significant investment over the last two and a half years”. Labbad adds that “it is important in reviewing the HDV at the Cabinet on 17 July, the Council does not take any step which infringes or damages Lendleases’s rights” and that it “must follow due process in fully and properly considering its obligations arising from this procurement” and is “obliged to act rationally” in view of its need for additional housing – a reference to a legal requirement of local authorities. Lendlease was selected as Haringey’s “preferred bidder” in February 2017. The report to the cabinet says this was undertaken in accordance with public contracts regulations and (paragraph 6.11) that the council is “able to discontinue the process and determine not to award the contract to the preferred bidder”. It further states (paragraph 6.26) that under an agreement between the council and Lendlease, the sum of £520,275 “will now need to repaid to Lendlease”. Further discussion of the “legal risks and implications” of what the cabinet wants to do is contained a separate, unpublished part of the report which the cabinet will consider in private. The “cabinet member introduction to the report”, which was written by council leader Joseph Ejiofor, says “this final decision that the HDV will not now go ahead” builds on election commitments to “set a new direction for the Council”. 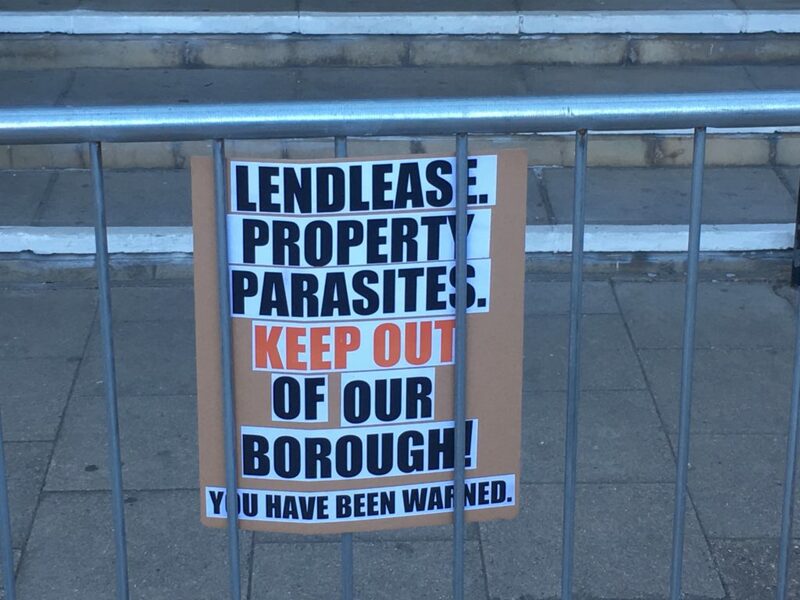 It expresses gratitude to Lendlease for its interest in Haringey and states that the decision is neither a reflection on the quality of the company’s work on the HDV project or “their desirability as a partner”. Ejiofor explains the new administration takes a different view from its predecessor of the balance between the “risks and demerits” and “the benefits” of the HDV (page 27, section 2). Ejiofor became Haringey’s new leader after the 3 May elections, which were preceded by a Labour council candidate reselection process which saw the replacement of many sitting councillors who supported the HDV plan, including erstwhile cabinet member for housing and regeneration Alan Strickland. Former leader Claire Kober was reselected, but later chose to stand down as a councillor. Stop HDV is led by members of Momentum, the group formed to support the leadership of the Labour Party by Jeremy Corbyn, bolstered by activists from other political parties and aggressive coverage by the Guardian. Ejiofor is a member of Momentum’s national coordinating committee and was formerly Kober’s deputy. His opposition to the HDV has been criticised by Stop HDV as “a bit spotty”. Deputy leader Emine Ibrahim, who is also cabinet member for housing and estate renewal, is Momentum national vice chair. Stop HDV, which described the joint venture plan as a “privatisation” which would lead to “social cleansing”, was central to the successful campaign to de-select Labour councillors who failed to oppose the HDV. This enabled to the formation of the new administration, which has been characterised by one local Labour member as the nation’s first “Corbyn Council”. Stop HDV, which claims that “the people of Haringey” removed Kober as council leader, has called for a rally to “celebrate the ending of the HDV”. Update, 15:32. This article originally wrongly attributed the report’s cabinet member introduction to Emine Ibrahim. Apologies. 9,000 households are on Haringey’s waiting list for social housing, it is unlikely that any of them would be able to afford the 40% “affordable” housing and equally unlikely that any of the current council tenants would be able to afford them either in order to free up social housing for those on the waiting list. There wasn’t even a commitment to replace the social housing that would be demolished so some of the displaced council tenants would probably have been offered accommodation outside the borough. Social cleansing at its finest, brought to you by Blairites who just saw a quick way to cash in.